Buddhism is vast! In the West, we live in an anti-intellectual, consumer society where gratification is increasingly immediate. Consequently, studying Buddhism is a problem for many. Where to begin? Many fall into the error of eschewing Wisdom, which is both the foundation and the goal of the Eightfold Path, and focusing on things that are more familiar or seem easier to them, especially “meditation” [sic!]. For many, the practice of Yoga is a comforting surrogate for the difficulties of the True Path. Yoga is familiar. It caters to our societal obsession with the body. Others pursue ethics and rote practices, and fall into attachment to rules and so become religious sectarian bigots and fundamentalist conformists. IMHO all of these groups are missing the point. For the few who might like to understand Buddhism as a Way of Wisdom, which is how the Buddha Himself presented the foundation of the Eightfold Path, and which became codified in the Prajnaparamita literature, I offer the following curricula of study. It is certainly equivalent to a B.A. + M.A. program (4 + 2 years). It is of course not the only valid course of study, and is certainly not complete (nothing could be) but it is the way that I have found useful so I offer it here for those who may benefit from it. Academic courses can be limited, limiting, and even debilitating, but often they are a good beginning, if only as a basis on which to build. Despite his rather pedantic presentation, Buddhism Course by Prof. Malcolm David Eckel is a great 24-video survey course that covers the gamut. Richard Gere refers to 13 episodes of this program in the introduction (module 1). However, I have only been able to find eight episodes on YouTube so far. Almost all of the Pali Canon is now available in good English translations. The much neglected and underestimated Pali Canon is arguably the universal historical foundation of the Buddhadharma. It was first committed to writing in Sri Lanka on palm leaves in the first century BCE, though few actual texts survive from that period. Nevertheless, it carries the stamp of oral transmission all over it and no serious scholar doubts its antiquity. While it would be naive to suggest that the words of the Pali Canon preserve the actual historical utterance of Gotama, who died about 300 to 400 years before it was committed to writing, it is increasingly obvious that it is the crucible from which all subsequent interpretations of the dharma emerged, including both “Hinayana” so-called and Mahayana. The Pali Canon is vast, numbering about 40 volumes in English translation, but the most important books of the Canon are listed below (the Abhidhamma was added later and is sectarian in nature). These books may be read in the English translations published by the Pali Text Society, Pariyatti, and Wisdom Books. I strongly recommend that you read these in their entirety, not selections, following the approximate chronology (see below). In general, it is best to read the most recent translation one can find. There are also free online translations, although I encourage you to acquire the physical books as you will find yourself returning to them again and again. I also strongly recommend more than a single reading. The entire Pali Canon is also available online, in Pali. The Pali suttas are highly diffuse and repetitive, but if one wants to understand them deeply and not merely learn them by rote (as most religionists do), at least several readings are required. 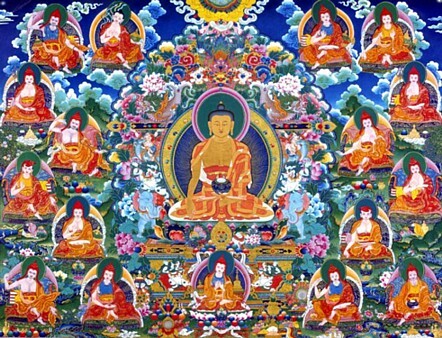 The Pali suttas represent the original presectarian teachings attributed to the Buddha. The first four nikayas are called the Great Four. The following is B.C. Law’s revision of T.W. Rhys-Davids’s chronology (History of the Pali Canon, 1933). According to Yoshira Tamura (Introduction to the Lotus Sutra (2014), p. 14) there are over six thousand Mahayana sutras. Mahayana sutras survive in Sanskrit, Chinese, Tibetan, or other translations. Shambhala has come out with a set of five texts traditionally ascribed to Maitreya. The main ekayana sutras include the Lankavatara Sutra, Avatamsaka Sutra, Lotus Sutra, and Shurangama Sutra, as well as the Śrīmālādevī Simhanada Sūtra, the Sraddhotpanna Sutra, and the Mahāyāna Mahāparinirvāṇa Sūtra. The following list is based on the Nine Dharma Jewels (navagrantha), the scriptures revered as the foundation and essence of traditional Nepalese Buddhism. Reading this group of scriptures in their entirety is considered to be especially meritorious. This is the modern list. About 600 years ago, two texts were removed from this list. These are the Pancaraksa and the Namasangiti. Another ancient collection of 49 Mahayana texts is the Maharatnakuta Sutra. Nalanda University was founded in the fifth century CE in Bihar, India, and rapidly became the centre of Buddhist learning for seven centuries, before it was destroyed by Islamist invaders in the 12th century. Its library was so vast it burned for three months. Nalanda was a universalist school including scholars of all schools and sects, and it became the template of Tibetan Buddhism. The Dalai Lama has identified 17 scholars that together constitute the Nalanda Tradition, to which I have added a recommended work in English, in most cases a translation of a major work by the author available from Amazon). You will find translations of the major work(s) of most if not all of these scholars in English translation, beginning with the Mulamadhyamakakarita of Nagarjuna, who is widely regarded as the greatest Buddhist philosopher of all time (if you only read one of these books, read Nagarjuna). The Dalai Lama has also recommended that all Tibetan Buddhists regard Padmasambhava, the great Tantric guru who converted the Tibetan people to the dharma and also taught at Nalanda, as their central object of devotion, so for English speakers I would add The Teachings of Padmasambhava, by Herbert Guenther. This is the only authentic recension of the earliest writings attributed to Padmasambhava available in English so far as I know. Commit to reading at least one work by each of the foregoing scholars. Gendun Chopel, The Madman’s Middle Way, trans. Donald S. Lopez Jr. There are others who deserve to be included here, especially His Holiness the Dalai Lama, who has written a number of general books of great interest. The YouTube videos of Robert Thurman are also very engaging. Avoid works that are excessively popular on the one hand or excessively academic on the other. Ward’s Indian Buddhism and Pande’s Studies in the Origins of Buddhism are very important academic works. The Western world is just beginning to discover the truth of Buddhism after the the long dark age of the West. I would recommend Kant (Prolegomena to Any Future Metaphysics), Hegel, Husserl (phenomenology), Heidegger, Gadamer (philosophical hermeneutics), Wittgenstein, Alfred North Whitehead (process philosophy), C.G. Jung (depth psychology), and Mircea Eliade. There are also many fine books on modern science, especially relativity, quantum physics, string theory, “digital physics,” technology, and cybernetics that are valuable correctives to the wholesale degeneration of contemporary society into doctrinaire scientism on the one hand and mindless consumerism on the other that is threatening to push us into complete barbarism (for this see anything by Noam Chomsky). The concurrence of these disciplines with the Buddhist world-view is an astonishing phenomenon that heralds the dawn of a new age. The foregoing is my personal program of study. Then, if you choose to specialize, you can do so with a clear conscience, and if you choose to enter further into the vast labyrinth of Mahayana sutras or Vajrayana tantras or termas, you will have a good foundation for the attainment of Right View and even the Perfection of Wisdom. 1. If you would like to try and decipher the original Pali texts, you will need two additional tools: a good Pali-English dictionary and a good grammar. Archive.org has an Introductory Pali Grammar PDF that you can download. A fully searchable database of the Pali Text Society’s Pali-English Dictionary is also available. Tamilcube also has a Pali-English dictionary online. See also Buddhadatta’s Pali-English Dictionary. Theravada.org has an Experimental Pali-English Translator too. Fortunately, typing the Pali alphabet is not required. 2. Will Tuladhar-Douglas, “The Navagrantha: An Historical Precis,” April 15, 2003, http://www.lrcnepal.org/images/presentation/pdf/cbhnm3/william.pdf. 3. A complete bibliography of Guenther’s books and articles is available at http://www.books-by-isbn.com/authors/herbert/v/guenther/. What the Buddha Taught, by Robert Gombrich, online. This is an exceptionally valuable study of original Buddhism.